During his talk, the annual joint London Mathematical Society/Gresham College lecture, Silverman explained how mathematics can be used to tackle crime, manage migration and counter terrorism. For example, the Migration Advisory Committee has used statistics to show that neither the popular perception of "migrants taking our jobs" nor the classical economic theory of migration is true (you can read the report on the MAC website). The effect of explosions on buildings can be predicted using finite element analysis. And most intriguingly, the mathematics of ancient Greece is used to keep track of offenders and undertake search and rescue operations. As well as having a physical description in terms of slicing through a cone, these shapes also have a very clear mathematical description: a circle is the locus of points the same distance from the centre (the focus of the circle); an ellipse is the locus of points with the same sum of distances from two foci (x+y equals a constant c in the image above); a hyperbola is the locus of points with the same difference of distances from two foci (|x-y| equals a constant c); and a parabola is the locus of points equidistant from a focus and a straight line called the directrix (x=y). This method, called trilateration, requires three transmitters (the GPS satellites in this case) to each send a transmission in order to determine someone's location. However another conic section can make this process more efficient. 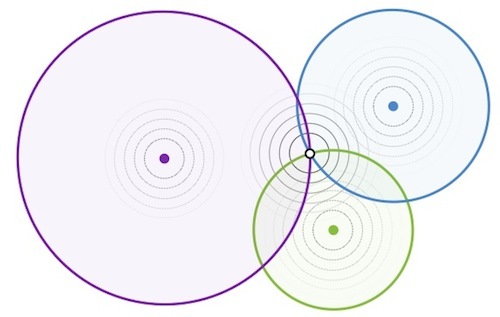 Multireceiver radar uses intersecting ellipses to find a target's location. This time I transmit a signal to which the target replies. Then, at another location, you have a receiver which picks up the reply. The initial signal I sent has travelled an unknown distance, x, between myself and the target, and the reply has travelled another unknown distance, y, between the target and you. Although we don't know these distances x and y, we do know their sum x+y is the total time from when I sent the signal to when you received the reply, multiplied by the speed of light. Therefore the target is somewhere on an ellipse with you and myself as the foci. By using three receivers we can intersect the three resulting ellipses to find the target's location, this time using just my lone transmitter and only two transmissions (my initial signal and the target's reply). One downside of this method is that it assumes the target will immediately reply to any signal we send; and what if we can't guarantee they'd respond? 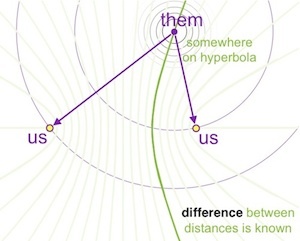 Another conic section provides the answer: hyperbolic trilateration. Hyperbolae allow us to locate a target by silently listening for any signals they transmit. 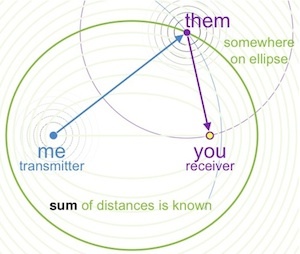 When a transmission is received in two different locations we know it has travelled an unknown distance, x, from the target to the first receiver and an unknown distance, y, from the target to the second receiver. Then the difference between these two distances is just the difference in flight times of these two paths (ie, the measured difference between the times at which the signal was received at the two locations) multiplied by the speed of light. Therefore the target lies somewhere on the hyperbola with foci at the two receivers. The intersection of three such hyperbolae (one for each pair amongst three receivers) locates the target using only the signals they have transmitted. This covert technique, called multilateration, was used in WWI to locate enemy artillery ranges by listening to the sound of their gunfire. Today this 2000 year old mathematics is used to find lost souls and uncover hidden enemies.